Hold your performance or event at Puppet Showplace Theater! Theatrical productions, music presentations, lectures, films, fundraisers, and parties are some of the ways that groups have creatively used Puppet Showplace Theater. We invite inquiries from arts organizations, businesses, and individuals regarding the use of our space. Our staff are happy to show you around during business hours to see if our space is a good fit for your event. Looking to rent the space for a Birthday Party? We have unique birthday packages available. Puppet Showplace Theater is located on the ground floor of a National Historic Register building in Brookline Village. The building is wheelchair accessible. Our space features an intimate proscenium style stage in a beautiful brick-walled theater. We have a small cabaret-style stage platform (approximately 15' wide x 11' deep with a 10' ceiling) with attractive red curtains. Puppet Showplace has a very basic, 5 instrument lighting system. There is no in-house sound system; renters are welcome to bring their own. Seating in the theater is on wooden benches that have backs and pads. Since the space is primarily used to present children's puppet theater, the benches in the front of the theater have very short legs. The theater legally holds 100, but 80 adults is the "comfortable capacity." No food or drink is allowed in the theater, but guests may consume food and beverages in the lobby (included in the rental). Set-up and clean-up are the responsibility of the renter. 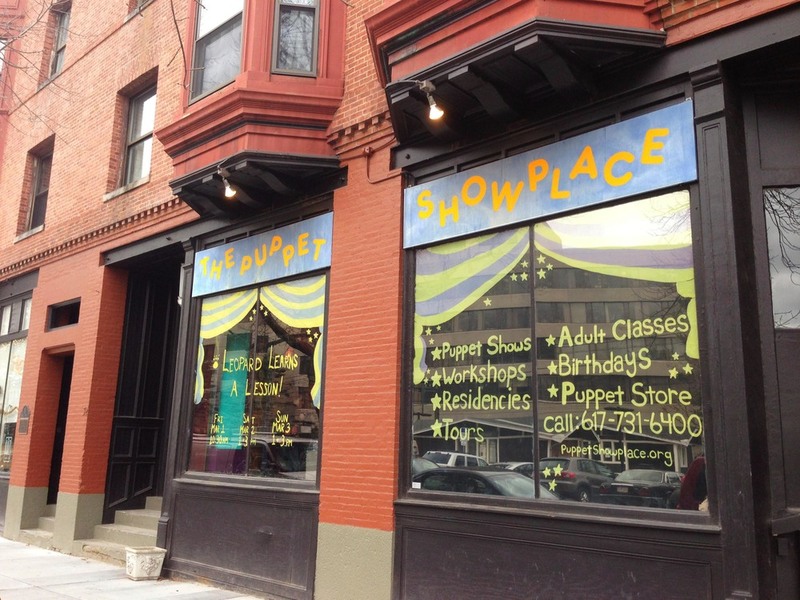 Puppet Showplace is located in a building with residential condominiums directly upstairs. For that reason we do not rent to groups presenting very loud activities, or shows that will continue past about 11 PM. Puppet Showplace Theater is conveniently located directly across the street from the Brookline Village T stop on the Green Riverside "D" Line. Parking is nearby at meters on the street (free after 6 PM) or in the parking garage at Brookline Place on Route 9 (on the other side of the subway tracks). Schedule availability for rentals is very limited. We strongly suggest having several dates and times in mind when you contact us. We are not typically able to accommodate extended runs of outside shows. For additional information and fee quotes, please contact our Box Office at 617-731-6400 x101, boxoffice@puppetshowplace.org, or use the contact form below.